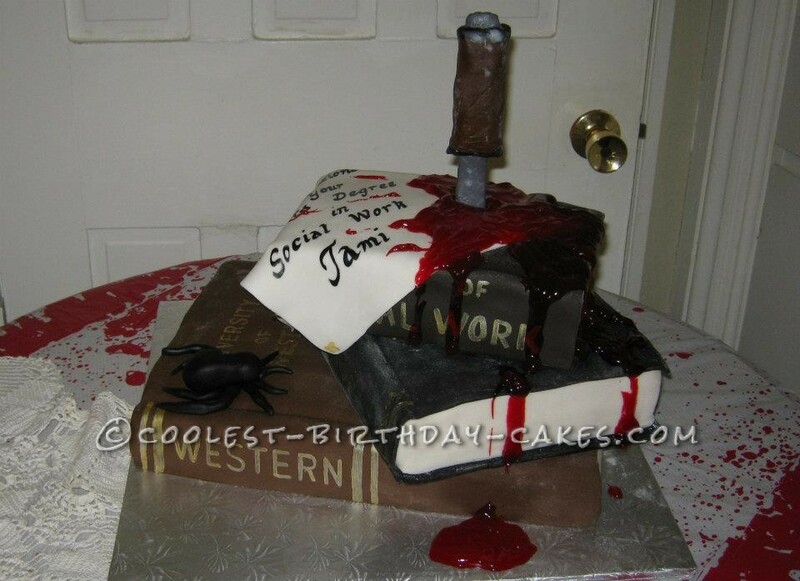 I had a specific request for this Halloween graduation cake; it had to be text books because it was for a graduation. It had to have a knife stabbed into it and it had to have what was written on the ‘sheet of paper’ . The girl was graduating with a Social Work degree around Halloween so it had to be a bit creepy gory too! I used her school’s names on the cakes for the book titles and her degree on the top book’s spine. All the cakes were covered in fondant after they were tiered and crumb coated. I used red tinted piping gel for the ‘blood’ representing the blood, sweat and tears she shed getting through the program. The knife was made out of poured sugar and wrapped in fondant. The text was written in gold lusterdust made into paint with vodka. Birthday cake idea posted by Cecile H.